Some email text is best viewed in Garamond instead of whatever the recipient's email program or service uses by default—something like Arial or Courier, presumably. You can specify a custom font for a message in Yahoo Mail. The choice of available fonts is not large, but Lucida Console is among them. Click Compose at the top of the Mail sidebar. Click in the body of the message. Go to the formatting bar at the bottom of the email screen and click on the AA icon. Select a font from those offered. They are Modern, Modern Wide, Classic, Classic Wide, Courier New, Garamond, and Lucida Console. Select a different size—from Tiny to Huge—in the same window. Type your message. It will appear in the font and size you selected in the formatting bar. If you've already typed the message, you can go back and highlight sections of it and apply formatting by clicking the AA and other icons in the formatting bar. This change is not permanent. 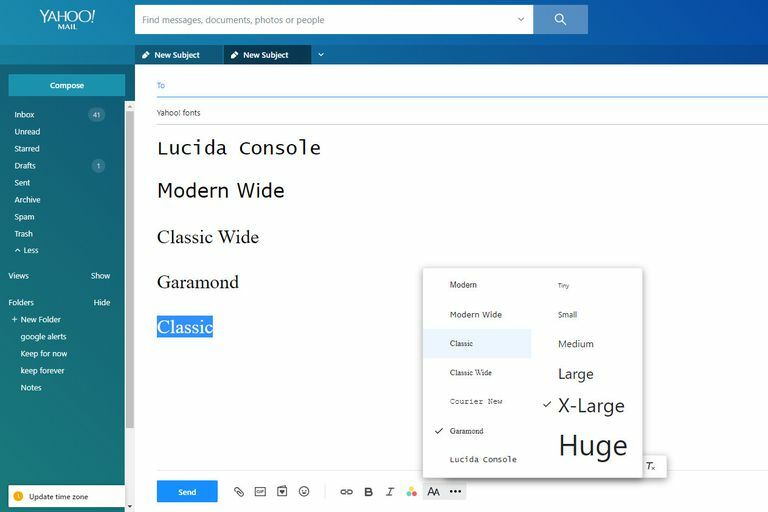 Your subsequent emails revert to the default font and size. You can make other enhancements to the text of your email using the formatting bar. It contains a Bold and an Italic icon for basic font changes and a Color icon you can use to change the color of the type and add a color highlight behind it. It also contains bullet lists and type alignment features. All these enhancements require Rich Text formatting to display. If you use the button in the formatting bar to switch to Plain Text, none of your enhancements will show. The same applies if the recipient has chosen to accept only plain text messages. In that case, none of your enhancements will appear at the recipient's end.